Only the best of the best will survive on “The Voice” Battle Rounds where Teams pit their own members against each other to sing-off matches. Coach Adam Levine said “this is where the competition gets really great.” Adam’s adviser is Stevie Nicks. She will come in and help prepare his team. Blake brought-in Country group “Little Big Town”. Gwen had her husband Gavin Rossdale from “Bush” serve as her adviser to prep her team for battle. Pharrell sought out Alica Keys. The coaches will have to decide who to keep, who to let go, and what artists to steal from another team. Gwen said she feels sick to her stomach because she wants everyone to win. Elyjuh Rene and Maiya were prepped for their battle by adviser Alicia Keys who Pharrell had them sing her song “If I Ain’t Got You”. “This is a massive song and you have to give it the weight that it deserves,” said Maiya during rehearsals. Pharrell said that he cares more about the emotion behind it than the technical stuff. Coaches Comments: Gwen said it was a close one, and hard to choose a winner. Adam said he’d go with Elyjuh. Blake said he felt like he had a front row seat to a concert, and called Miayah “world-class.” Pharrell said they were successful at making it difficult for him. He said Maiya’s voice was shooting out like lightening bolts. Battle Winner: Elyjuh won the battle. Pharrell said his tone is great and what he sees in Elyjuh is that he is really trying. Pharrell also said that Maiya didn’t really fight in her battle. Chris, a mailman, and Jonathan who’s a Nashville music student, were really star-struck by Adam’s adviser Stevie Nicks. “There’s a vulnerability and sweetness to their voices that I really like” Adam said and that they are very good. Nicks told them the best thing is to walk out onto the stage with a killer attitude. Adam said, “Both Jonathan and Chris have their unique challenges to face.” Adam told them to sing their faces off. They sang “Young Girls” for their battle song. Coaches Comments: Blake said Jonathan’s voice “cuts through” and Chris sings so loud that it was distorting the sound and almost broke the PA system. Blake didn’t pick a winner. Pharrell said he heard all of the articulation from Chris and called them both “sick”, he picked Chris. Coach Adam said Chris’ biggest thing is projection. Adam said “there’s something about this dude” – Chris is the winner! Jean Kelley, and Sugar Joans, a manager of a shoe store, were advised by Gavin Rossdale. Gwen gave them “Survivor” by Destiny’s Child to sing. Gwen said the song has to be all about the attitude. Jean said singing “Survivor” brings out the fighting spirit. Gwen said the song calls for more stage presence, and sass. Steal – Adam said “that was so incredible…” then Pharrell hit his button to steal Jean also. Pharrell said, “you’re one of those voices that makes this show what it is – the voice.” Jean picked Pharrell to be her new coach. She said she thinks Pharrell can make her a better performer. Craig is looking to jump-start his music career. James is looking for his big break. Blake’s advisers “Little Big Town” made a big impression on the two. Blake gave them the song “Wave on Wave” to sing. Blake said he only has room for one male country singer on his team. Coaches Comments: Pharrell said “That was crazy! How do you choose”, and said it’s so hard – it’s two distinctive styles. Gwen told Craig his voice is so strong and he’s so comfortable on stage. 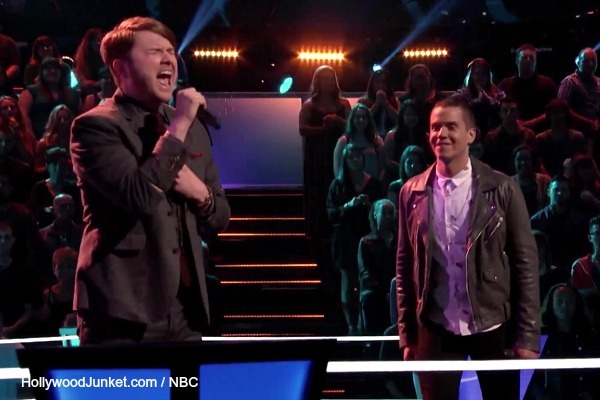 Adam said they achieved what they all hoped for – singing a song like they’re a duo. Blake sarcastically thanked the coaches for their input. He said “I wish someone had have sucked.” Blake chose James as the battle winner. Battle Winner: James David Carter. Steal – Gwen swooped-in at the last minute to steal Craig Wayne Boyd! Amanda is a Graphic Designer and previous church singer who was in the closet about her sexuality. Taylor is a waiter and works at a dog hotel. Gwen said she paired them because they’re alternative rock. Gwen gave them “Jolene” song to sign. Gavin said Amanda has “a voice of the ages”. Gwen said it’s clear that Taylor is an artist, and he was in his own world. Gwen said she’s looking for whomever can show her who’s the better alternative artist. Coaches Comments: “That’s a tough song” and lethal if not done well said Adam. Adam also told Amanda that she was performing in an engaging way where Taylor was being more careful, but he still picked Taylor. Blake said Amanda had him because she was more invested and “sang the crap” out of it. Pharrell said Amanda got lost in the song, and that Taylor made it his own and he has what it takes. Gwen said it’s terrible because they are both so good. She said Taylor really came far. Alicia Keys is their team adviser. Griffin and Luke are singing “Maybe I’m Amazed” because Pharrell said it would be great to see them “super honest”. Pharrell said Luke needs to work on his falsetto which is necessary for him to win this battle. They were singing the song perfectly, but they didn’t really get it until Alicia challenged them to sing the song like Aretha Franklin. Coaches Comments: Gwen said it was “so amazing.” She said Griffin’s voice was like butter. Adam said Luke is the best singer in this competition right now . He said Griffin became a peer of Luke’s, but then hit a note that was “damn that was high!” Blake called it one of the best battles. Pharrell said it seems like Griffin is never going back, and he’s this “new Griffin”. Steal: Blake and Gwen hit their buttons to steal Griffin. Gwen said Griffin is really a fighter. Blake said Griffin occupies a space that few artists do, and told him “please don’t say no to me twice”. Griffin chose Blake.